I've read the tutorials. I've studied the instructional videos. I've rolled my eyes at everyone's rigid, unbending opinions of how it must be done. 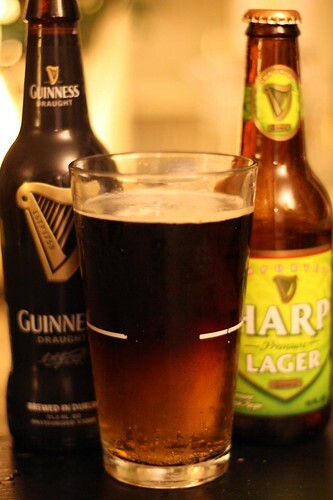 So, tonight I was ready, again, to try to make a black and tan. My previous efforts with Guinness Extra Stout hadn't worked so I reverted to the regular Guinness Draught. I did use the one out of the bottle and a lot of the tutorials have claimed that the only real way to do it is by using the Guinness out of the can. If there's one thing I like to ignore it's the rigid opinions of food "experts" on the internet. Success! After many tries I was able to achieve a decent Black and Tan! I guess technically it should be called a Half and Half but I don't care. The dark beer floated on top of the light beer. Tonight I broke St. Patrick's Day convention by doing the unthinkable. 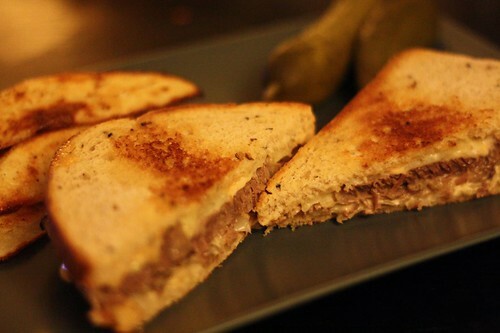 That's right, making Reubens on March 16th! Since we'd cooked up a bunch of corned beef over the weekend it was time to enjoy our favorite day after St. Patrick's Day dinner the night before the actual holiday. We do, however, realize that this means we have to come up with something else "Irish" for tomorrow so that we can put this week of pseudo-Irish eating to an end. Jen declared these Reubens the "best ever" which is pretty high praise. There was something quite good about them but I can't really figure out exactly what it was. The sauce was simply mayonnaise, ketchup, Dijon mustard, and hot sauce. I did use half Irish cheddar because I didn't have enough Swiss for the entire sandwiches. Maybe that brought them to the next level. At any rate, our week of "Irish" cooking is about to draw to a close. Who knows what wonders will await us! One thing is for sure: I bet none of it will be authentic. I guarantee if you used the other stuff they wouldn't have been as good. You did us right! You always do.